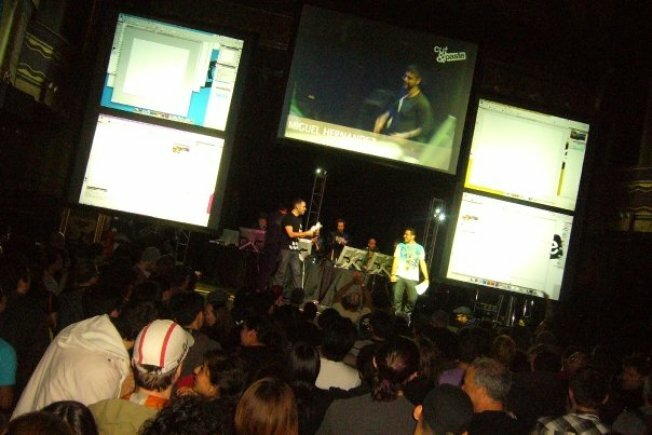 The crowd at Webster Hall watches as the Cut&Paste MC introduces a round of designers. If I had closed my eyes at some point during Cut&Paste's digital design throw-down at Webster Hall this past Saturday night, what I heard could've easily been some kind of music festival, complete with surging crowds and random "woo-hoos!". But instead, I dutifully kept my eyes trained on the four monitors on stage as the city's top designers duked it out in front of the packed house; clicking, dragging and resizing in their design program of choice to a soundtrack of drop beats and dance tracks. The event's emcee proudly displayed an over-sized chain necklace complete with a gold-plated computer mouse, which served as a clear "Wrong Way" sign for any confused New Yorkers who accidentally showed up. It was a night for geekery, where masters of the Macintosh fought it out for the title of New York's Best in 2D, 3D and motion design. The night's winners, Miguel Hernandez for 2D and Jake Guttormsson for motion design will move on to Cut&Paste's Global Championship, along with Neil Benjamin, the winner of the 3D competition, right here in New York City in June at the Hammerstein Ballroom. There, the 48 winners from all 16 cities on 2009's Cut&Paste tour will fight it out for a slew of digital prizes and the titles of world's best designer in their respective fields.